Inflammation is part of the body’s immune response to remove harmful stimuli, including damaged cells, irritants or pathogens. Inflammation can help heal infections, wounds and tissue damage. However, when it gets out of control, it can actually damage the body. Inflammation can be acute or chronic. Acute inflammation starts rapidly and quickly becomes severe, with symptoms usually lasting for a week or two. On the other hand, chronic inflammation can last for several months to years. Symptoms of inflammation are redness, swollen joints that feel hot to the touch, joint pain, joint stiffness and loss of joint function. Inflammation may also cause general flu-like symptoms like fever, chills, loss of energy, headaches, loss of appetite and muscle stiffness. Often, only a few of these symptoms are present when suffering from inflammation. A wide range of health problems are linked with inflammation. They include acne, asthma, sinusitis, atherosclerosis, periodontitis, celiac disease, hay fever, chronic prostatitis, inflammatory bowel diseases, ulcerative colitis, Crohn’s disease, rheumatoid arthritis, interstitial cystitis and even cancer. If you want to get or remain healthy, it’s important to control inflammation in your body by following a healthy lifestyle and diet. 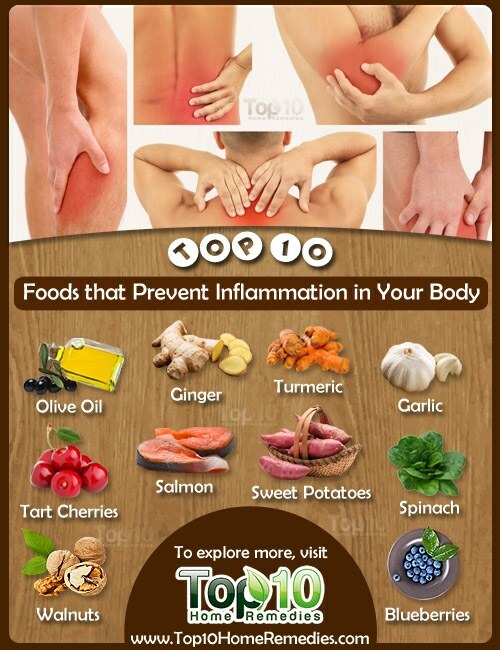 Many foods have anti-inflammatory properties that can help prevent and combat inflammation. Here are the top 10 superfoods that prevent inflammation in the body. Olive oil can offer protection against inflammation due to its beneficial compounds. A 2011 study published in Current Pharmaceutical Design showed that the compound called oleocanthal in extra-virgin olive oil prevents the production of COX-1 and COX-2 enzymes in the body that cause inflammation. When it comes to fighting inflammation, always opt for extra-virgin olive oil. It can even reduce the risk of health conditions related to inflammation like degenerative joint diseases or diabetes. Use this oil for cooking foods and to make healthy salad dressings. Warm olive oil used as massage oil helps reduce pain, swelling and inflammation from arthritis and muscle cramps. Ginger contains a compound known as gingerol that has anti-inflammatory properties. According to a 2005 study published in the Journal of Medicinal Food, ginger affects certain inflammatory processes at a cellular level. This makes it an effective treatment for both acute and chronic inflammatory diseases. People with osteoarthritis or rheumatoid arthritis notice reduced pain and swelling along with improved mobility after consuming ginger on a regular basis. Ginger can also reduce post-exercise inflammation. You can use dried or fresh ginger root to make ginger tea. Drink ginger tea 2 or 3 times daily. To reduce inflammation, you can even massage the affected area with ginger oil a few times daily. Ginger capsules provide better benefits than other forms. Consult your doctor for the correct dosage. Note: Avoid consuming too much ginger as it can thin the blood. This popular yellow spice used in Indian cooking also helps prevent inflammation. The active ingredient curcumin in turmeric is an antioxidant that has anti-inflammatory properties. 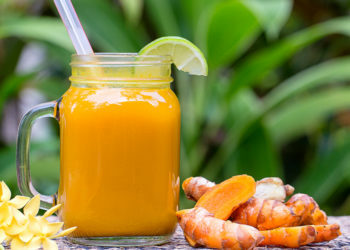 According to a 2003 study published in the Journal of Alternative and Complementary Medicine, researchers reviewed many studies on curcumin and concluded that it inhibits a number of different molecules that play a role in inflammation. Turmeric is very effective in reducing inflammation due to arthritis, muscle sprains and other injuries. You can use turmeric powder in your cooking to prevent inflammation in the body. You can also drink a cup of turmeric tea or a glass of hot turmeric milk 1 or 2 times daily. A paste prepared with turmeric powder and warm sesame oil applied externally on the skin helps reduce inflammation and swelling. Do not apply this turmeric paste on broken skin. Turmeric is also available as a dietary supplement. However, one must take supplements only under a doctor’s guidance. A 2012 study published in the Journal of Medicinal Food found that several compounds in garlic have anti-inflammatory therapeutic potential. In fact, another study indentified four different sulfur-containing compounds in garlic that help shut off the pathways that lead to inflammation. Eat 2 to 3 raw garlic cloves daily on an empty stomach to prevent inflammation. Also, use garlic in your cooking as much as possible. You can also rub garlic oil directly on an affected area for relief from pain and inflammation. Another option is to take garlic capsules as a dietary supplement, but only after consulting your doctor. In a 2010 study, researchers from Oregon Health and Science University found that people who drank juice made from tart cherries noticed a reduction in the level of inflammation in their bodies. Regular consumption of tart cherry juice a week prior to a strenuous running event can also help minimize post-run muscle pain and inflammation. Experts recommend eating 1.5 cups of tart cherries, or drinking 1 cup of tart cherry juice, once daily. To enjoy the anti-inflammatory benefit, drink unsweetened juice made from fresh, organic tart cherries. Note: Tart cherry juice may cause abdominal discomfort and diarrhea. If you experience these side effects, stop drinking the juice. Cold-water fish like salmon is high in omega-3 fatty acids like eicosapentaenoic acid (EPA) and docosahexaenoic acid (DHA), which help reduce inflammation. Studies suggest that these fatty acids play a key role in reducing the level of cytokines in the body. Cytokines are compounds that promote inflammation. To enjoy the anti-inflammatory benefits, eat grilled, baked or roasted salmon dishes as overcooking can destroy the healthy fats. The American Heart Association recommends eating salmon 2 or 3 times a week. If you do not like the taste of fish, opt for fish-oil supplements to cut inflammation. However, consult a doctor before taking a supplement. 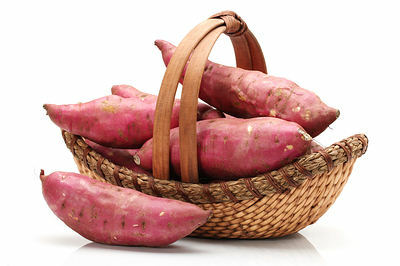 Sweet potatoes, especially the purple variety, can help heal inflammation in the body. A 2011 study published in the Journal of Medicinal Food reports that sweet potatoes have anti-inflammatory potential due to their concentration of nutrients. Their high content of vitamins C and E and the carotenoids alpha- and beta-carotene help reduce pain and inflammation in the body. Regular intake of sweet potatoes can help reduce inflammation in the brain and nerve tissue throughout the body. Eat at least 1 cup of sweet potatoes on a daily basis. You can use sweet potatoes to make french fries, pancakes, cookies and chips. For better health, enjoy baked, roasted, grilled or mashed sweet potato dishes. This dark leafy green vegetable can also greatly help prevent as well as reduce inflammation. Spinach has plenty of carotenoids that work as inflammation-reducing antioxidants, and vitamin E. These components help protect the body from pro-inflammatory molecules called cytokines. In addition, spinach is a good plant source of alpha-linolenic acid (ALA) that works as a potent anti-inflammatory agent to reduce pain and inflammation. 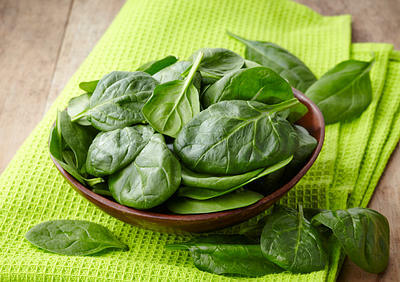 Spinach can help reduce asthmatic inflammation, arthritis pain and migraine headaches. You can enjoy this green vegetable in the form of a salad, vegetable juice or a green smoothie. Also, spinach can be added to soups, side dishes or omelets. 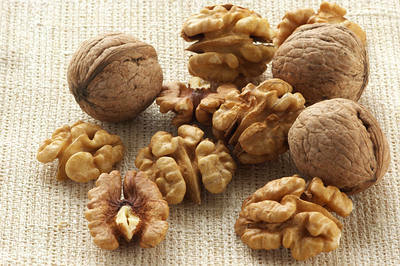 Another good inflammation-fighting healthy food is walnuts. They are high in ALA, a type of omega-3 fatty acid that reduces inflammation in the body. A 2004 study published in the Journal of Nutrition found that people who ate at least 2.3 ounces of walnuts daily had reduced levels of inflammatory markers like C-reactive protein (CRP). High CRP indicates a high risk of suffering from heart disease due to inflammation. Regular consumption of walnuts can help prevent chronic diseases, such as heart disease and arthritis, and promote bone health. Soak 3 or 4 walnuts in water overnight. The next morning, eat these soaked walnuts with breakfast or as healthy mid-morning or mid-afternoon snack. You can also include walnuts in smoothies, cereals or baked goods. Several phytonutrients in blueberries like anthocyanins, hydroxycinnamic acids, hydroxybenzoic acids and flavanols function both as antioxidants and anti-inflammatory compounds in the body. These phytonutrients reduce inflammatory processes in tissues by increasing the cells membrane’s functionality to allow important nutrients and chemical processes to reach the cells. Moreover, blueberries are low in fat and calories. Regular consumption of blueberries reduces the risk of developing arthritis and can help protect against intestinal inflammation and ulcerative colitis. It is recommended to have 1 serving (about 1/2 cup) of blueberries daily. 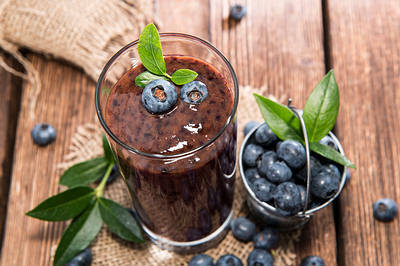 You can include blueberries in smoothies, fruit salad, cereals and baked goods. very good for us humans thanks a lot …. this page realy hepls thnks. Oh awesome, it’s so helpful to me.I want more. very informative and intelligent page. very helpful. Very good information, very helpful .!!! You left pineapple off this list! Bromelain has long been known to reduce inflammation. Thanks for real nice tips for various cures ,similar to old “Dadi ke Nuskhe”. thanks nice information to the people like me.